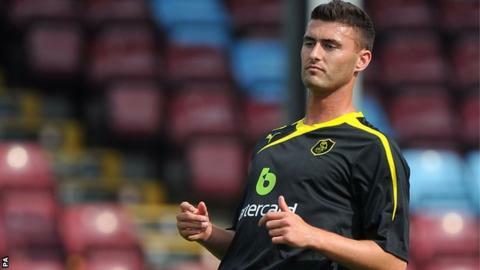 Carlisle United manager Graham Kavanagh is interested in signing Sheffield Wednesday's Gary Madine after being in touch with him while he was in jail. The 23-year-old striker left prison on Thursday after five months behind bars. Sheffield Wednesday, 2011-present: 100 games, 27 goals. He played for Carlisle from 2007 to 2011, and trained with the club in September prior to being sentenced. Kavanagh said: "I sent him letters to keep his spirits up and if Wednesday decide he's not their cup of tea, I'd take him without a shadow of a doubt." Madine was last October for assaulting two fans in separate Sheffield nightclub incidents. Wednesday issued a short statement after Madine was released from jail, merely confirming that he would be holding talks with the club about his future. "I'd hoped to visit Gary and was in contact with his uncle to try and sort it but I didn't manage to get over," Kavanagh added. "He's still under contract, but I think there is a real possibility that Sheffield Wednesday could let him go. "There's a new manager now that may want to look at him first, but certainly I would be interested in signing him."